Looking for the right idea for the kitchen is not easy. You must consider all the factors and function of the kitchen itself. Okay, first, think about the function. Do you frequently use the kitchen for daily activities? Do you often have a meeting or a party at home? Do you have a lot of family members? If so, think about the farmhouse kitchen. 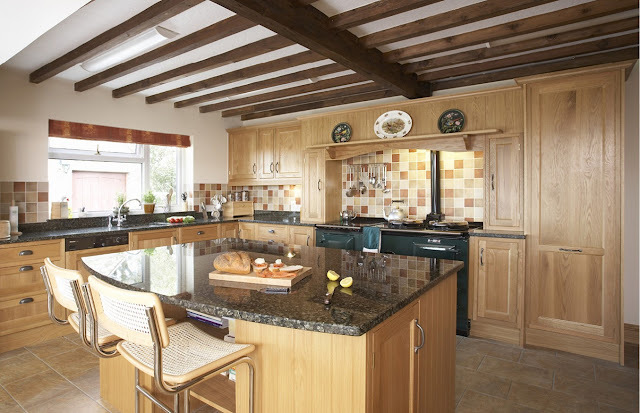 Farmhouse kitchen has the impression of earthy and warm welcome with a classy style. It is a classic and farm house combine with vintage and modern elements. They have two key points; the first, they are attending to used natural materials, such as wood (oak, maple, pine, and cherry). A house with a vintage style can be combined with a farmhouse kitchen. You can add a floral pattern, typical of the vintage. You can place a floral rug in the subway tail and also add vintage lamp style. Placing a wooden table as a substitute of a island is also a great idea. A worn table and coupled with a rug which can be placed under the table. Other idea is to use antique wood that you can install on the ceiling. In addition, you can combine with a rock. It is a popular idea in medieval and country kitchen; even so the farmhouse still exists. The designers have developed some brilliant ideas to apply in the farmhouse kitchen, like combine modern elements with rustic touches. For example, a vintage-style chandelier in the mix with a closet door concurrently with a metal stove. Accompanied by the island made of wood along with a bar stools. For the floor, you can use stone materials with bold colors. A touch of cottages can also be applied in the farmhouse kitchen. For example, you can install a sink-style cottage coupled with a simple hardware in the cabinet with white colors and also the hardwood floor. Go with cottage colors is the fastest way, such as navy blue. Blue creates the impression of shade and comfortable. Or, you can use breadboard. You can use imitation breadboard for a more affordable price.